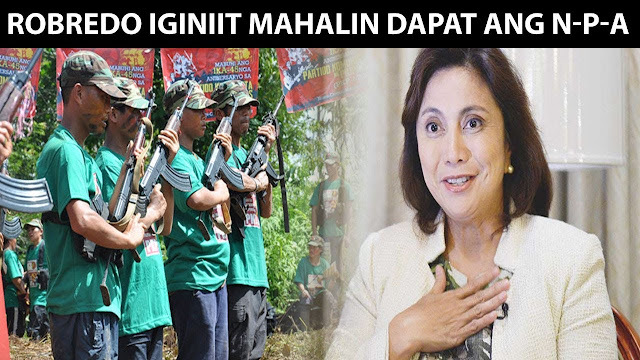 Babaeng BIKTIMA ng NPA, SINUPALPAL si ROBREDO matapos niyang IPAGTANGGOL ang mga ito! A netizen who claimed to be a daughter of the victim of a New People’s Army (NPA) criticized Vice President Leni Robredo for defending the Communist armed group. This is after the vice president warned President Duterte on his order to the military to kill NPA members if they see them armed. Duterte, in his speech last Wednesday at the ceremonial send-off of Vietnamese fishermen at the Sual Wharf and Causeway in Pangasinan, he ordered soldiers to kill NPA rebels if said they are armed, and that he as their Commander-in-chief shall answer for them. He also told them not to answer issues of human rights, and that he will do it for them. In an interview with reporters in Caloocan city on Thursday, November 30 after the Bonifacio Day commemoration, VP Robredo said that everyone who commits crime should undergo due process, and be punished according to what the Constitution says, adding that it President Duterte’s order to kill armed NPA members is against the law. However, the female netizen whose identity was not revealed said that she does not agree with VP Robredo’s statements. According to her, she is only girl in the family, and she was forced to work abroad because her parents and older brother were killed by the NPA. Nevertheless, she did not mention when and where it happened. Below is the screenshot of her Facebook post. “Naranasan mo na bang hingan nila ng pera kahit kulang pa sayo ang kinikita mo? Natutukan ka na ba ng baril pag ayaw mong magbigay? Higit sa lahat, namatayan ka ba ng mahal sa buong buhay nang sunugin ng NPA ang bahay mo habang natutulog kayo? Lahat yun, dinanas namin sa NPA.” The netizen wrote, whose post is now going viral on Facebook. “Sigurado ako, ni isa sa mga binanggit ko, di mo dinanas. Kaya wala kang karapatang sabihin na dapat ay may due process sila. Hindi nila kilala ang demokrsayanglsinasabi mo, kaya nararapat lang na ubusin sila. Wala silang karapatang mabuhay!” she added, saying that NPA members knows no democracy, and all of them should be exterminated.